One big reason for Alexis Sanchez’s stunning decline since leaving Arsenal for Manchester United in the January transfer window is the different approaches used in training. The Chile international was one of the best players in the Premier League during his time at the Emirates Stadium, but it just hasn’t worked out for him at all at Old Trafford despite plenty of excitement surrounding his move at the time. While numerous factors seem to be at play, including relationship troubles in his personal life, the Metro state that one big change came in United training. 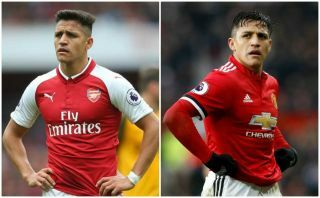 Sanchez was used to doing much more work on the ball during his time at Arsenal under Arsene Wenger, whereas Jose Mourinho’s training methods revolve more around tactics and physical fitness, according to the Metro. United fans won’t be too pleased to hear that Mourinho once again seems to be somewhat responsible for draining all the best qualities out of a clearly talented player, though of course that alone seems a bit of a stretch to explain such a sharp decline. That said, it makes sense that this would be something quite different to what Sanchez is used to, with the 29-year-old at Barcelona before joining Arsenal, where a similar emphasis on on-the-ball technique seems likely to have been a key focus given the similar styles of play adopted by both clubs. Mourinho, meanwhile, is a totally different animal in that regard and has become famed in his career for fit and focused defensive sides. This seems to be seeing him lag behind now, however, with United’s quality of football not really up to scratch in comparison to their rivals right now.